Big bunnies need a lot of space! As a bare minimum, any hutch must allow an adult bunny to complete at least 4 bunny-hops along its length and allow the bunny to sit upright without his/her ears touching the roof. Many hutches, especially those sold by pet shops, are simply too cramped for any bunny and certainly too small for a large-breed. Often a 6' x 4' or 8' x 4' shed plus a large enclosed run is a better option with the windows removed and replaced with a weld-mesh grid to provide both ventilation and daylight. In some areas, planning permission is needed to install a shed larger than 6' x 3' so please check with your Local Authority. 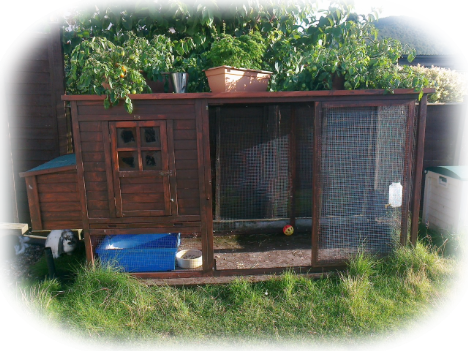 An alternative is a chicken coop inspired design which offers many benefits - a large enclosed and weatherproof 'bedroom' area, a ramp leading to the ground floor. 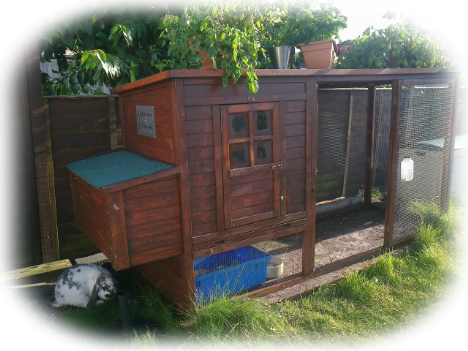 The 8' version pictured offers space for a pair of large-breed rabbits space to run around, stand up, sit and hop while also providing ample daylight. The timber isn't the best quality but with annual treatment using a bunny-safe preservative such as Cuprinol, should last about 10 years or longer. 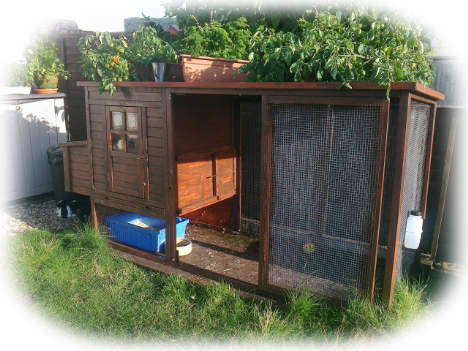 It needs to stand on a suitable plywood or OSB3 standboard base rather than grass to both help prevent the frame rotting if standing on damp grass but also because the residents will quickly eat the lawn and it's not always practical to move it. If the lawn is even slightly uneven it would also rock - so a secure flat base made from treated timber or structural strandboard is essential. This is ideal budget accommodation and costs around £120-£150 on eBay. Larger versions are also available.